Wanderer knows whereof he writes. His decades of experience in advertising for major newspaper and magazine publishers in New York and Los Angeles, in addition to his legal background, inform the intricate plot, corporate maneuvers, and intriguing characters in "The Holiday Party." "Many people have faced a corporate takeover situation and struggled because they feel they helped build something and are a part of something, but then suddenly everything changes,"
Wanderer explains that he wrote the book not only as a compelling read, but in part as a survival guide for individuals facing a corporate takeover. He offers the following tips, which appear sprinkled through the story. - Research. Find out about the new company and how they treat current employees, because in all likelihood, that's how they will treat you. - Reach out. Meet with the new company's human resources department, but be positive, and get all your paperwork. - Reinforce. Take your paperwork to an actuary to ensure that you receive all your benefits. "Certain magic words like 'late retiree accrual' can open up employee earnings they may never have known they were entitled to," Wanderer notes. - Retain. If you feel you have been treated unfairly in a takeover situation, consult a lawyer specializing in employment law. And contact the bar association in your area about free legal assistance. - Receive. As the new management takes over, be receptive to the new style, but don't share negative comments. - Revisit. A corporate takeover can provide a chance to explore a new career, enhance skills by returning to school, or start your own business. 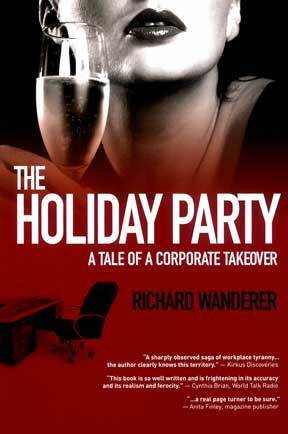 "The Holiday Party"was inspired by an amalgamation of situations and characters I've met over many years in the advertising field, plus my author's imagination," Wanderer adds. The plot centers on a family-owned magazine that is taken over by a large media corporation, but not all the employers and employees on both sides of the merger are what they seem. Reviews of the book highlight Wanderer's attention to detail. As noted in Kirkus Reviews, the novel is " a sharply observed saga of workplace tyranny … the author clearly knows his territory," and readers comment that it "reads like a good movie." For more information about the book and the author, visit theholidayparty-ataleofacorporatetakeover.com.